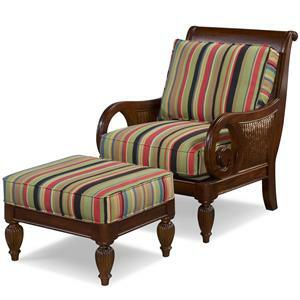 This Mediterranean styled chair is a wonderful way to accent a room. With its distinctive arms that turn inward and down and back around, with the wicker filled space between the arms and the back frame and its louvered back, it will become a focal point of your room. Many fabric choices to customize the look for your room. 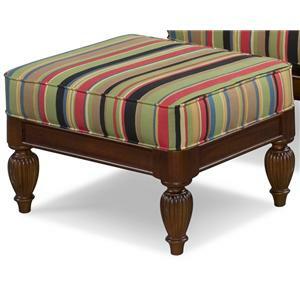 Add the matching ottoman to complete the look. The Grand View Accent Chair by Braxton Culler at Hudson's Furniture in the Tampa, St Petersburg, Orlando, Ormond Beach & Sarasota Florida area. Product availability may vary. Contact us for the most current availability on this product. 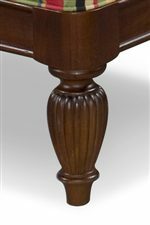 This collection has a distinct Mediterranean look about it with its arms that curve under, the wicker filled space behind the arms and reeded spool legs. The dark hardwood frames contrast the fabric beautifully. A dramatic look that can be added to many decors as an accent piece. Many fabric choices to design your own look. 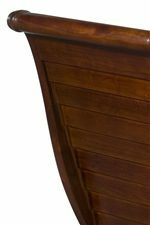 The Grand View collection is a great option if you are looking for Coastal furniture in the Tampa, St Petersburg, Orlando, Ormond Beach & Sarasota Florida area. Browse other items in the Grand View collection from Hudson's Furniture in the Tampa, St Petersburg, Orlando, Ormond Beach & Sarasota Florida area.